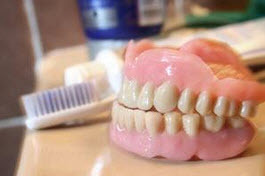 Dentures are prosthetic dental devices designed to replace missing teeth. Dentures can either be partial dentures, which replace a few missing teeth, or complete dentures, which replace all of the teeth in one jaw. Partial dentures are a good idea when a few teeth are missing, because they keep the remaining teeth in their proper place. If there is a space where no teeth are present, the teeth may shift out of their correct positions. This is when all the teeth are removed and the tissue is given time to heal before the dentures are placed. It could take a few months for the gum tissue to heal completely, and during this time you will be without teeth.Traditional dentures are used after the tooth extraction sites heal. 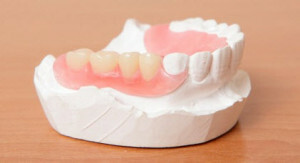 After the healing process is completed, these dentures are adjusted to make them suitable for long-term use. Prior to having your teeth removed, your dentist takes measurements and has dentures fitted for your mouth. After removing the teeth, the dentures are immediately placed in your mouth. The benefit is that you do not have to spend any time without teeth. You will, however, need to have a follow up visit to refit your dentures because the jaw bone will slightly change shape as your mouth heals. The dentures will need to be tightened after the jaw bone has healed. Partial dentures are another option when not all of your teeth need to be removed. This is similar to a bridge, but it is not a permanent fixture in your mouth.Your dentures may take some time to get used to. The flesh colored base of the dentures is placed over your gums. Some people say that it feels bulky or that they don’t have enough room for their tongue. Other times the dentures might feel loose. These feelings will affect the way you eat and talk for a little while. Over time, your mouth becomes trained to eat and speak with your dentures and they begin to feel more and more like your natural teeth. They may never feel perfectly comfortable, but it is much better than the alternative of not having teeth. Conventional/cast Partial Denture – This type of Partial Denture has a metal framework and is used mainly with patients who have some remaining teeth. Overdentures – This type is made of all acrylic and is used mainly with patients who have periodontally compromised remaining teeth. This type of Partial Denture can be converted to a complete (full) denture in the future if the remaining teeth are lost. Flexible Acrylic Partial Denture – This type of Partial Denture works great for patients who have had a difficult time adapting to a conventional Partial Denture. Patients love this type for its comfort. One of the things that patients with dentures may experience is increased salivation. Some mouth soreness and speech changes are possible as a patient gets used to their new dentures. These problems go away over time, especially if the dentures are properly fit. Most sets of dentures last a long time, but they may need to be replaced or repaired if they are damaged acutely or over time.